« Video: Burress Being Shopped Around? The Giants locked Brandon Jacobs up for at least the 2009 season by slapping the dreaded “franchise player” tag on him this afternoon. That decision — only the second time the Giants have ever used the “franchise” tag and the first time since they tagged Jumbo Elliott in 1993 — guarantees Jacobs a salary of $6.621 million next season, which is the average of the top five running back salaries last year. However it’s not a decision that Jacobs likely took very well. According to a source familiar with the talks between Jacobs and the Giants, the two sides are expected to continue negotiations and their intentions are still to have Jacobs sign a long-term deal with the club. However, according to a source close to Jacobs, if the two sides can’t come to an agreement he does eventually plan sign the franchise tender in time to report to training camp. There’s a bigger problem, though, for Jacobs than not getting the seven-year, $45 million contract with $16 million in guarantees that an NFL source said he was seeking. If a long-term deal can’t be worked out, there’s a possibility now that Jacobs will have to wait two years before he can be an unrestricted free agent again. If the NFL and the NFL Players Association can not come to an agreement on a new Collective Bargaining Agreement before next March, then starting in 2010 players won’t be eligible to become unrestricted until after their sixth NFL season. Jacobs, 26, just completed his fourth NFL season. So, in the event that loophole in the current CBA is triggered, he would only be a restricted free agent after next season. That means the Giants would only be required to tender him at 110 percent of his 2009 salary (or $7,283,100) and they’d be able to match any offer he receives from another team. Jacobs would then be eligible to be unrestricted after the 2010 season, though by then there would presumably be a new CBA with new rules in place. So, essentially, by using the tag for the first time in 16 years, the Giants — depending on what happens with the new CBA — may have locked Jacobs up with for two years at $13,904,100. That’s still far less than he was seeking, especially since only his 2009 salary is guaranteed. It was not immediately clear why the Giants made this seemingly radical decision, especially knowing how unpopular it would be with Jacobs. They haven’t even used the “transition player” tag since 1996 when they slapped that on running back Rodney Hampton. Their organizational philosophy the last 13 years had been that those tags do nothing but force them to pay higher salaries than they were planning, while making the player angry because he lost his shot to test the open market. However, the Giants and Jacobs weren’t exactly close in their attempts to strike a deal. According to two sources who had spoken to someone involved in the negotiations, the Giants’ opening offer was closer to $25 million over six years with about $12 million guaranteed. 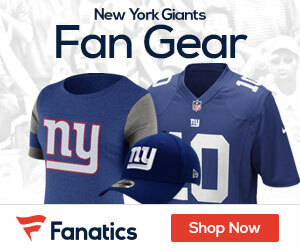 One source said the Giants’ offer was laden with incentives related to playing time because they were worried about Jacobs’ injury prone nature. In his two seasons as the Giants’ No. 1 running back, Jacobs has missed eight of 32 regular-season games. 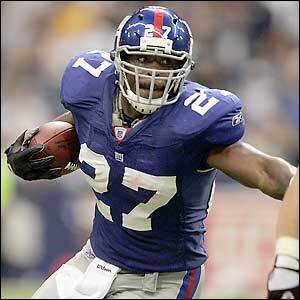 Of course, he’s also topped 1,000 rushing yards each season — 1,009 in 11games in 2007, and 1,089 in 13 games last year. And at 6-4, 264 pounds, he’s one of the best big backs in the NFL. Considering the drop off in the Giants’ rushing attack when he’s not on the field (which was about 70 yards per game last season) Jacobs believed he was indispensable, which is why he was seeking the same contract the Dallas Cowboys gave Marion Barber last year. Back in January, Jacobs said he was “confident” he and the Giants would reach a deal long before they even had to consider the “franchise” tag. He also made it clear that returning to the Giants was his priority. As far as I’m concerned this had to be done. Jacobs is the key to the offense, and will be needed if the Giants want to repeat as division champs.